Posted in English, Teacher education and development on January 23, 2017 by Nataasha Southwell. 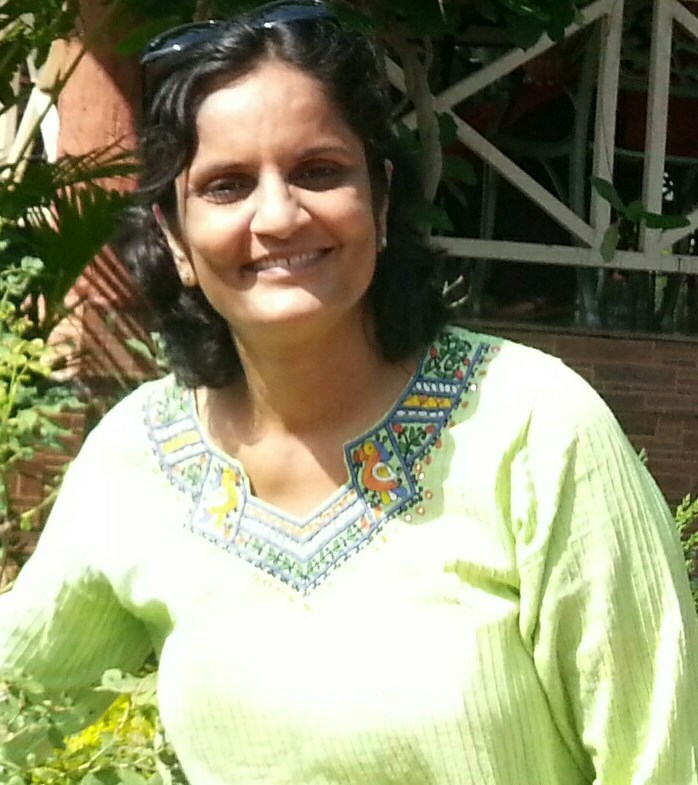 Dr. Neena Jha is an educationist who has traversed both rural and urban landscapes as part of her work with various schools, universities and NGOs. She has mentored children from rural backgrounds, conducted various capacity building programmes and teacher-training workshops and recently worked in developing public libraries into digitally inclusive spaces. Switching from teaching Commerce in Delhi University, she moved to teaching English and communication skills formally as well as non-formally. Currently she is an independent consultant engaging with the education and development sectors. Find out more about Neena’s journey here. Growing up in multiple cities of India gave me ample insights into English being spoken in all its regional senses and savours. It fascinated me to absorb various intonations and mother tongue influences on this globally unifying language. While pursuing my doctorate in public finance, I taught commerce to undergraduates in Delhi University in 1989. The ELT journey began after my relocation to Champaran, Bihar post marriage in 1991.The kids here were good at Maths and Sciences but struggled with English. They felt alienated from the language despite studying in English medium instruction schools. That set me to shift gears to ELT. I started to impart English lessons and later joined a missionary school as a teacher of English. Apart from textbook lessons, I encouraged children to interact in English in everyday situations, making a conscious effort not to negate learnings from their mother tongues. I used their home language/s as a resource for cross-linguistic linkages. Thereafter in Patna, I conducted English communication classes for students, professionals and government functionaries who had had their education in Hindi or other regional languages. My assignment with the World Bank on the Bihar Teacher Education project recently, reinforced the conviction that enhancing teacher effectiveness adds to improving student learning outcomes resulting in robust education systems. 2. What advice do you have for teachers when they’re developing their skills and knowledge in the professional practice ‘Understanding educational policies and practice’? It goes without saying that our own education has to be ongoing. Both proficiency and professional awareness are important. To keep abreast of the developments in policies relating to educational practices in India, I would recommend that teachers visit the NCERT portal. Teachers may also visit the websites of other non- government organisations like British Council, BBC, CSF EdMonitor and Pratham to raise their awareness about recent trends in education and access resources. Being aware of the updates in educational policies and practices can be valuable pegs for ELT professionals to hinge their classes on and keep them attuned to the national educational goals. As outlined in British Council CPD Framework for teachers, teachers should be able to locate relevant information about educational policies and practice at multiple levels. However this is still a challenge despite such phenomenal growth in online content and resources. We, then, should adopt such professional and pedagogical practices that go hand in hand with the policies relating to various aspects of our profile ranging from goals of education to access to education. We have to remember to customise them in tandem with local learner needs and aspirations. We also need to consider the changed circumstances in which English language is learned and used in this era of globalisation to make it accepted and acceptable. 3. What educational policies do you think teachers need to be aware of to develop their understanding of classroom practices? How can teachers find out more about these policies? The teacher in the classroom is responsible for aligning the vision of the stated policies with ground situation of learners. The goals of education have to converge with a child’s holistic development- physical, mental, moral, emotional, social and spiritual. NCF 2005 is a key document that teachers need to be thoroughly familiar with in order to enhance their understanding of the key principles that should guide their classroom practice. Also reading of online resources come in handy. For instance, the CREATE- collaboration, relevance, evidence, alignment, transparency, empowerment approach to ELT policies and practices makes a lot of sense to ELT facilitators. The recent insights from linguistics, psychology, and associated disciplines have also provided a principled foundation to revitalise curricular practices for teachers. They all point to a more empirically grounded approach to ELT that would assist to supplement our content for curriculum and pedagogic purposes. In ELT roles, let us strive to create multi-linguals who can enrich more languages than one. This methodology, I feel, would address growing apprehensions of regional language and culture getting endangered with the adoption of a new language. In addition, the pedagogic code of moving from the known to the unknown shall come into play in this way. 4. What key points from these policies would you like to highlight for teachers of English? For teachers taking language classes, I think it is important that they are aware of the language policy governing their respective region and state. Moreover they must be in sync with ICT and integrate them in their classrooms to strengthen learning processes. Since language has a direct bearing on literacy, that is another relevant area for the teacher to keep in mind. Teachers are in a position to achieve national literacy goals as also usher in equality and inclusion in the communities they work with. Another focal point would be to sensitise students about the importance of implications of language and vocabulary. Yet another key thing would be to empower the learner by equipping them with better communication skills that would augment their confidence and competence in other disciplines too. Teachers of English can foster peace skills in children by avoiding use of aggressive or violent language, thereby contributing to mitigate the flaring gap between purpose and processes of education. Instilling gender sensitivity in their classrooms is another lifelong skill that would help towards realising a goal as fundamental as equality. The young students would grow up to respect and celebrate diversity, practise tolerance and value peace. Education would thus serve the ultimate purpose of harmonising and humanising its stakeholders. 5. How do teachers use their learning from these policies to help them in their classroom practice? A nuanced understanding of these policies enables teachers to achieve much beyond defined course objectives. The NCERT position paper on English gives a simple yet effective suggestion about having print-rich environments, especially to enable pre-literacy learning. Putting up charts, blurbs, signboards, and even graffiti in the classroom helps familiarize the elementary learner with the school environment, and sows seeds of early education. Moreover making smaller groups in the classroom and organising activities like role plays and radio shows not just makes learning fun for students but also facilitates the teacher in knowing and assessing individual and team skills better. Another important takeaway from policy documents like the NCF 2005 would be establishing co-curricular and cross-curricular linkages. While taking up P.B. Shelley’s Ode to the West Wind in class for instance, the teacher could compare the use of imagery and symbolism with John Keats’ Ode to Autumn. The phenomenon of the westerly from geography and the process of water cycle from natural sciences may be referred to for integrated and reflective learning. Turning every lesson into an experience of its own, rather than merely reading and interpreting it, goes a long way in helping students connect with the subject in particular and with life outside the classroom in general. Really fortunate enough to have a great mentor like you at very early stage of my life. Many thanks for your guidance and support! I found this interview very informative and encouraging as an outsider and Parent myself. Initiatives like this will certainly help to ensure quality education for next generation not only in Urban india but more importantly in rural india.